Bienvenue chez Cape View II Beachhouse! La propriété dispose d'un lit King avec salle de bains et deux chambres de la reine à l'étage. Il y a aussi un canapé-lit dans le salon principal et un Rumpus / quatrième chambre avec canapé-lit en bas offrant jusqu'à 10 personnes. Trois salles de bains au total, dont la principale dispose également d'une baignoire spa. Des vues spectaculaires sur l'océan depuis la plupart des chambres s'étendant sur la plage de surf de premier plan de Forster et Cape Hawke complètent deux grands ponts de divertissement surplombant la piscine. Trois grands aquariums d'eau salée garderont les hôtes amusés. Les excellents repas et divertissements du parcours de golf de Forster sont à 200 m à pied et la dôme de sable One Mile Beach est encore plus près. We were comfortable in the property, it had everything we needed and a great view. Thankyou. It was great hosting you and we hope to see you again sometime. Enjoyed our few days wished it could of been more. Grand children enjoyed the pool and loved the 3 fish tanks, were sad when they had to leave. Beds were comfy, only down side of the accommodation was no air con in bedrooms. Would not suit anyone with mobility issues, lots of stairs to enter. Overall would not hesitate to recommend for accommodation. Glad you enjoyed your stay. It was a pleasure to host you and you are welcome back anytime. The owners were warm and accommodating, allowing us to check in early and calling in to make sure everything was as expected. The location of the house commands a wonderful view and although a little further from the town centre than we had hoped, the well maintained pool compensates. We would have liked to have had supplied tea and coffee making supplies and some soap or shower gel in the bathroom. Some instructions on how to use the smart tv would have been useful. Fantastic spacious, family friendly home. Perhaps not for toddlers as there are internal and external stairs. Well equipped kitchen. Kids enjoyed the massive fish tanks. 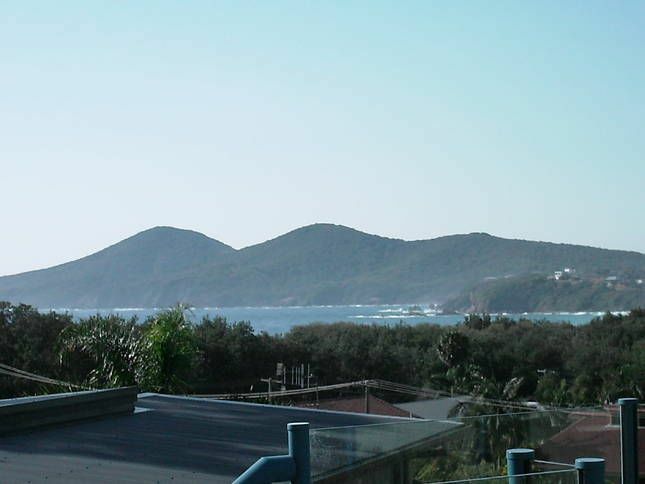 Only minutes walk to the most beautiful One Mile Beach and Forster Golf Club. Would come again ! It was an absolute pleasure to meet and 'host' you! We had a great family holiday over Chrissy and this was the perfect property and location. Heaps of room to spread out, fantastic outside area and pool surround, all within walking distance of the beach and golf course. The owner was very helpful with a few questions we had and gave us some great suggestions for eating out etc.